My Liverpool Tours offer private guided tours in Liverpool and across the UK. 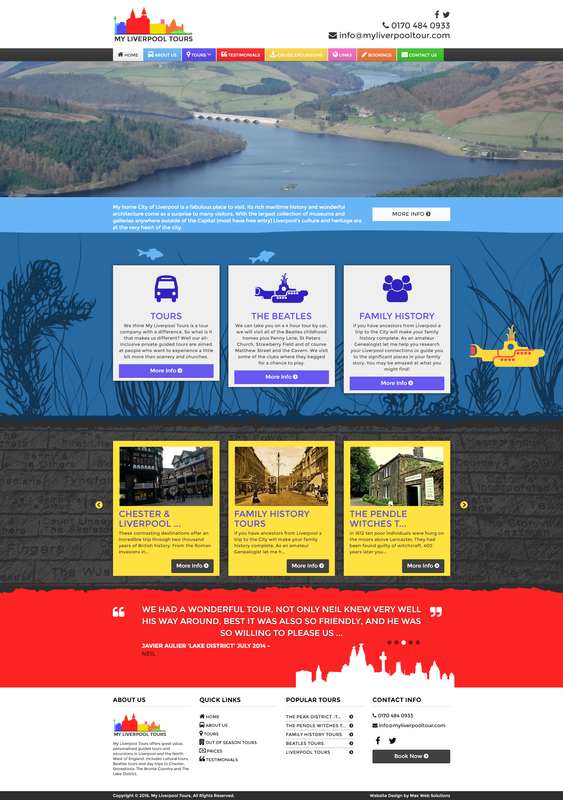 We were asked to create a website that displays all of their services and tours. The website also had to allow potential clients to make enquiries and book with ease. Liverpool is a great city with many many attractions and traditions. My Liverpool Tours run interesting yet factual tours of Liverpool and surrounding areas. Maxweb were approached by Neil at My Liverpool Tours to design a logo and develop a website. The branding specification was bright and colourful and to involve something significant and unique about Liverpool. We developed a multi-coloured Liverpool skyline logo and used the same colours throughout the website design. The end result is a bright vibrant website that is easy to use and allows the visitor to check dates and prices and to book online. My Liverpool Tours have gone from strength to strength since the launch of the new website and now offer tours to Chester, the Lake District, the Peak District, Snowdonia, Lancaster and many more places.